Copyright © 2013 Weimin Zhang. This is an open access article distributed under the Creative Commons Attribution License, which permits unrestricted use, distribution, and reproduction in any medium, provided the original work is properly cited. In this paper a generalized tanh-function type method is proposed by using the idea of the transformed rational function method. We show that the -expansion method is a special case of the generalized tanh-function type method, so the -expansion method is considered as a special deformation application of the transformed rational function method. We demonstrate that all solutions obtained by the -expansion method were found by the generalized tanh-function type method. As applications, we consider mKdV equation. Compared with the -expansion method, the generalized tanh-function type method gives new and more abundant solutions. Direct searching for exact solutions of nonlinear partial differential equations (NLPDEs) plays an important role in the study of nonlinear physical phenomena and becomes one of the most exciting and extremely active areas of research investigation. In the past several decades, many effective methods for obtaining exact solutions of NLPDEs have been presented, such as inverse scattering method , Darboux and Bäcklund transformation [2,3], Hirota’s bilinear method , Lie group method , variational iteration method , Adomian decomposition method  and so on. Most recently, Prof. Ma and Lee  proposed a new direct method called the transformed rational function method to solve exact solutions of nonlinear partial differential equations. The transformed rational function method provides a more systematical and convenient handling of the solution process of nonlinear equations, unifying the tanh-function method, homogenous balance method, Jacobi elliptic function expansion method, F-expansion method, Exp-function method. The key point is to search for rational solutions to variablecoefficient ordinary differential equations transformed from given partial differential equations. In this paper using the idea of the transformed rational function method, a generalized tanh-function type method is introduced to solve exact traveling solutions of NLPDEs. We also show that the -expansion method [9-16] is a special case of the generalized tanh-function type method, so the transformed rational function method includes the -expansion method. We demonstrate that all solutions obtained by the -expansion method were also found by the generalized tanhfunction type method. As applications, we consider mKdV equation. Compared with the -expansion method, the generalized tanh-function type method gives new and more abundant solutions. The rest of the paper is organized as follows: In Section 2, using idea of the transformed rational function method, a generalized tanh-function type method for finding travelling wave solutions of NLPDEs was introduced. In Section 3, we show that the -expansion method is a special case of the generalized tanh-function type method. In Section 4, we applied this method to mKdV equation and compared with the -expansion method, the generalized tanh-function type method gives new and more abundant solutions. In Section 5, some conclusions are given. A detailed describe of the transformed rational function method can be found in Ma and Lee’s paper . Using the idea of the transformed rational function method, a new approach called the generalized tanh-function method is proposed. The key point of the new approach is based on the assumptions that the solutions can be expressed by Laurent polynomial (a special case of rational functions) and that solution variable satisfies Riccati equation. In the following we give the main steps of the generalized tanh-function type method for finding travelling wave solutions of NLPDEs. where is an unknown function, is a polynomial in and its various partial derivatives, in which the highest order derivatives and nonlinear terms are involved. where . , , are constants to be determined later , and non-negative integers and can be determined by considering the homogeneous balance between the highest order derivative and nonlinear terms appearing in ODE (2.2). Step 3. By substituting (2.3) along with (2.4) into ODE (2.2) and collecting all terms with the same order of , ODE (2.2) will yield a system of algebraic equation with respect to , because all the coefficient of have to vanish. Step 4. With the aid of Mathematica or Maple, one can determine, and by solving the system of algebraic equation of Step 3. 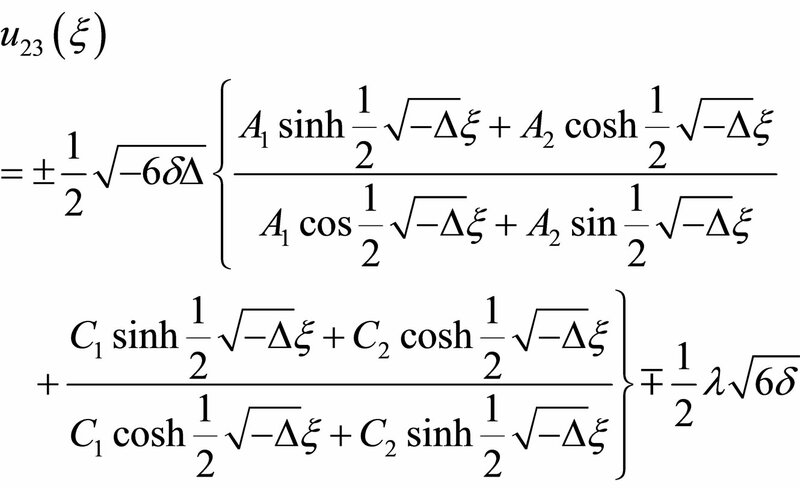 Using the following formula of indefinite integrals, we can obtain general solution of Riccati Equation (2.4). We notice that the expressions (2.6a) and (2,6b) are more cumbersome than (2.5a) and (2.5b), and solutions expression of the -expansion method are just from (2.6a) and (2.6b). Where . The degree of the polynomial can be determined by the homogeneous balance method. The coefficients of the polynomial can be obtained by solving a set of algebraic equations resulted from the process of using the method. where are constants. In the -expansion method, uses the result from (2.6a) and (2.6b), so the -expansion method is equivalent to the generalized tanh-function type method. Remark 1. In Equation (2.3) and Riccati Equation (2.4), if and respectively, then the generalized tanh-function type method degenerate the tanh method. The idea of the tanh-function type method can go back to . Remark 2. If we take in Equation (2.3) and take , in Equation (2.4), then the generalized tanh-function type method degenerate modified extended tanh method which can be obtained more exact solutions than tanh-function method, hyperbolic function method and other more sophisticated methods . Remark 3. 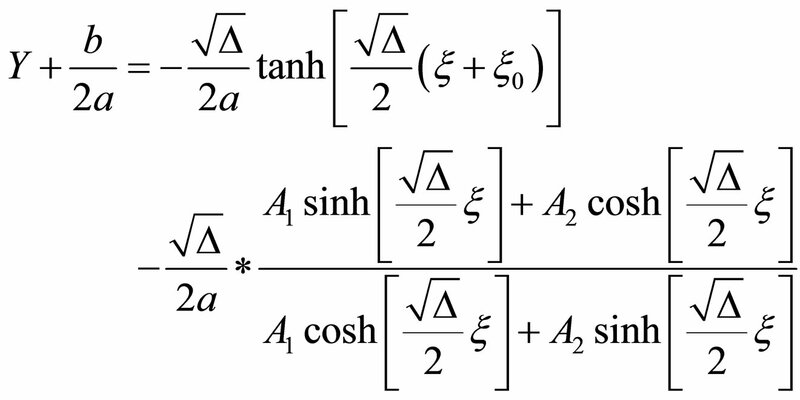 In Riccati Equation (2.4), if , the generalized tanh-function type method is equivalent to -expansion method. In the section we will illustrate the generalized tanhfunction method with mKdV equation. 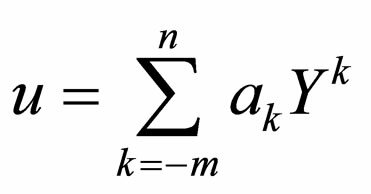 Let us consider mKdV equation in the form . where are constants to be determined later, . The example comes from Wange’s Letter , but it is worth noticing that the solutions (4.9c), (4.10c), (4.11c) are not obtained by Wang  by using the -expansion method. The example shows that the more abundant travelling solutions can be obtained by using the generalized tanh-function method. The generalized tanh-function type method can be viewed as an application of the transformed rational function method. In fact, using the idea of the transformed rational function method, many methods to solve NLPDEs can be obtained. In this letter we show that the - expansion method is a special case of the generalized tanh-function type method, so the -expansion method is considered as a special deformation application of the transformed rational function method. It is worthy noticing that the generalized tanh-function type method is more concise and straightforward to seek exact solutions of nonlinear partial differential equations (NLPDEs) and can be applied to many other NLPDEs in mathematical physics. The author would like to thank Referees for valuable suggestions. This paper is supported by Jiaying University 2011KJZ01.